Canberra early childhood educators also walked off the job earlier this year. Photo supplied by United Voice. More than 150 Canberra early childhood educators will walk off the job tomorrow afternoon to protest at “appalling levels of pay” which are as low as $21 an hour. A number of Canberra childcare services are expected to close early when the protesters leave work at 3.20 pm tomorrow (Thursday) and assemble near Commonwealth Avenue Bridge for a ‘Honk-A-Thon’ – where drivers are encouraged to honk in support of their bid for equal pay. Other childcare centres will take part in the protest by holding supporting events in their centres. 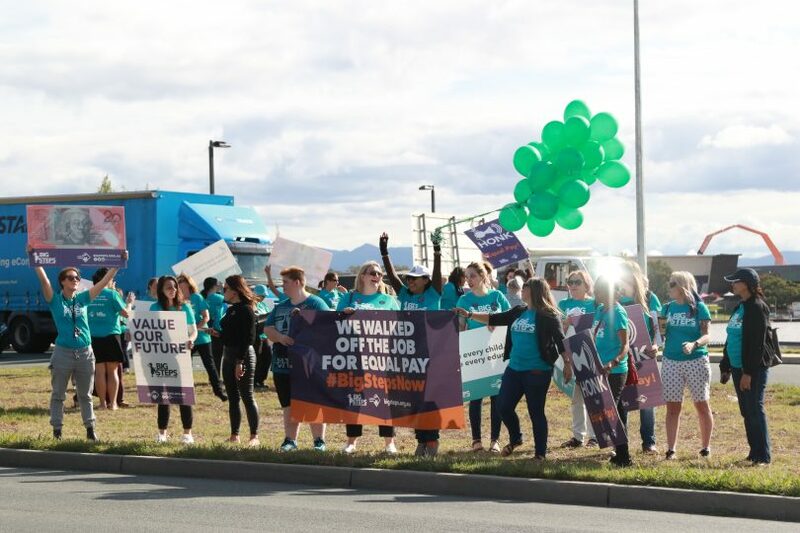 The Canberra workers are participating in a national protest organised by the union United Voice which is billed to be “the biggest early education walk off in Australian history”. 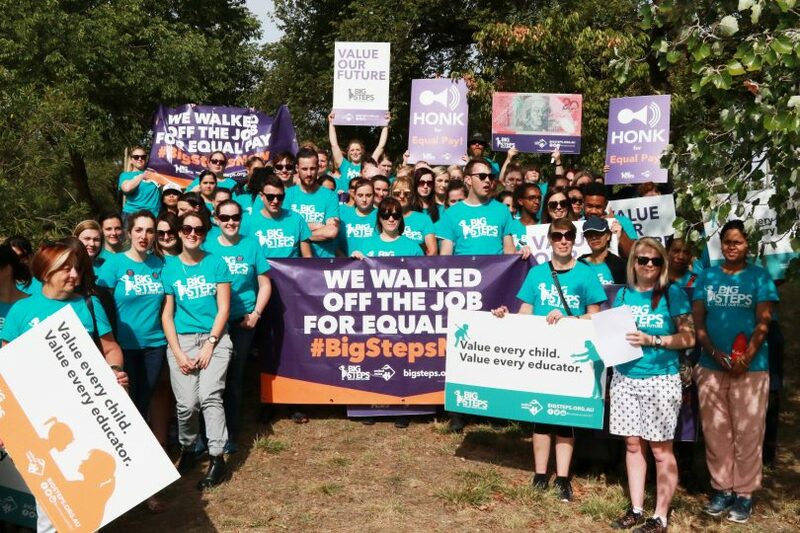 It will be the second ‘walk off’ this year as part of the campaign for professional pay for early childhood educators. “Early childhood educators in the ACT are participating in national action to protest their low wages,” said United Voice ACT branch secretary, Lyndal Ryan. “They are fed up with government policies that do not address the fundamental issue of low wages. “They are highly a skilled and dedicated group, the vast majority of whom are women, who just can’t put up with poverty wages any longer,” Ms Ryan said. “This Thursday ACT educators are taking further action to demand that the government address this issue. Ms Ryan said that the educators and supporters will assemble near Commonwealth Avenue Bridge around 3.45 pm. “They will encourage drivers to honk to support equal pay for early childhood educators,” she said. Canberra early childhood educators are campaigning for equal pay. Photo supplied by United Voice. United Voice Assistant National Secretary Helen Gibbons said that Australia’s early childhood educators are a highly-educated, skilled workforce but only earn around $21 an hour. “As long as the government continues to ignore them and pass the buck on funding equal pay, from here on in they will continue to escalate their action,” Ms Gibbons said. Ms Gibbons said the early childhood educators are walking off the job at 3.20 pm “as it represents the time of day that educators effectively start working for free because of low wages”. Do you think early childhood educators should be better paid? Should their pay rates better reflect the importance of their work? Let us know your thoughts in the comments below. It’s hard to believe they are serious with all those smiling, happy faces. It was the same impression conveyed on TV last night with many waving to passing cars. They had a lot of printed corflute placards and signs too; they don’t come cheap so I guess the union was digging deep for them. Actually they are child minders or babysitters but “childhood educators” sounds better when you have a barrow to push. Part of the reason for the pay rates is that it is a comparatively recent industry. 50 years ago it didn’t exist & babysitting was done by grandparents, neighbours & friends. I had 3 kids in childcare & found that there was little relationship between the qualifications of the workers & the quality of the care given.